There are many different types of toys available that you can purchase for your ferret, but all too often they enjoy the packaging more than the toy itself. Homemade toys are a great way to provide stimulation using inexpensive items, or items found around your house. Interactive toys that stimulate their natural instincts, intellect, and curiosity are the best – such as tunnels, Foraging Toys, dig boxes, teaser toys, etc. Constantly rotating toys keeps them “new” and fresh – a toy that has been hiding for a few weeks or more and suddenly taken back out is like getting a brand new toy!! This keeps them interested and excited, and helps reduce them becoming bored of the toys they have. Remember – no toy is ever better than interaction with their humans. Added bonus: rice will help to absorb excess oils and loose fur from your ferret, acting like a “dry bath” and can help reduce odor. Change your rice when it begins to turn yellowish from their oils. NOTE: STARCH peanuts only, styrofoam peanuts are a blockage hazard and are very dangerous. To tell if your peanuts are starch or styrofoam, place one in a cup of water. A starch peanut will dissolve, styrofoam peanuts will not. 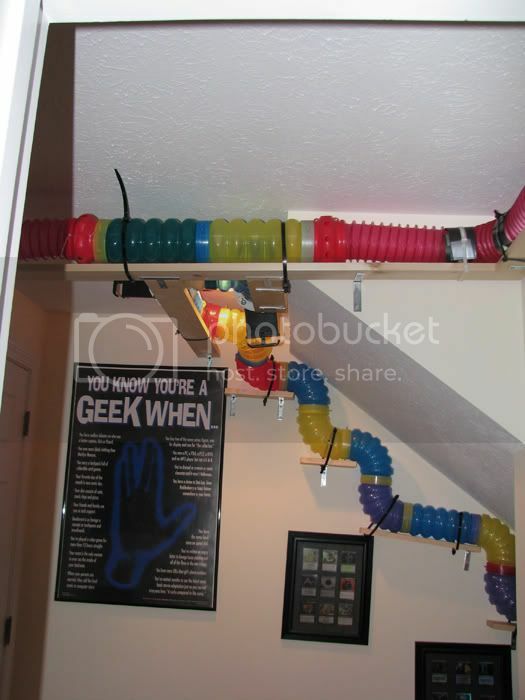 cut the ends off and tape together to create your own custom tunnel! Tunnels may be connected in fun configurations using elbow and T pieces! Tunnels may be used on their own, or you can construct new designs to your heart’s desire! 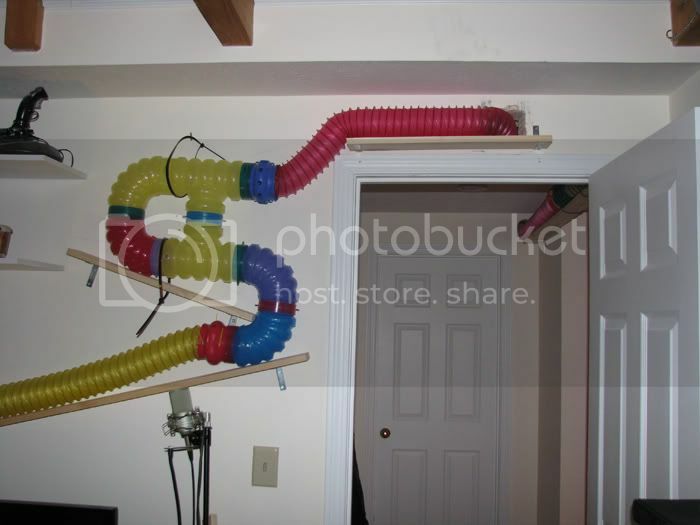 Examples include connecting tunnels to rubbermaid bins or boxes, wrapping tunnels around a cat tree for a safe climb up and down, or running tunnels along walls for wild mazes! Ferrets are easy to please and while you may be tempted to buy a lot of expensive toys for them, you will quickly learn that they are often far more interested in the box the toy came in than the toy itself! Boxes can be connected to each other to create fun towers, caves, and mazes. Attach boxes to tunnels to amp up the fun. Or fill a box with blankets for a nice sleep spot. Foraging Toys are a great way to keep your ferrets occupied when you are busy or traveling, as well as providing great mental stimulation! See the Foraging Toys Page for more ideas! Riker P “kills” his mousie teaser toy. Teaser toys help to stimulate your little carnivore’s natural hunting instincts. And it is endlessly fun to watch them chase and jump after a teaser! Teasers can be bought in the cat toy department, or you can make your own by tying a favorite toy OR food item to a string. Noise making toys are exciting and stimulating toy – and even deaf ferrets can feel the vibrations made by the toy. Ferret-Pile in the Sleeping Den! In between playing, your ferret will want lots of refreshing naps! Providing a dark and cozy place for them to sleep will help them feel safe, as well as simulate their natural burrowing instincts. Sleeping dens can be made from rubbermaid bins or cardboard boxes, or you can get creative with your own ideas! Use your imagination! Anything that is ferret-safe, and small enough to be carried or dragged is fair game for stashing! For extra stimulation, clean out a stash and toss the items around the room – then release your ferret to watch them scurry around to re-stash the items! Okay so this isn’t a toy…but walks outside (on a harness!!) 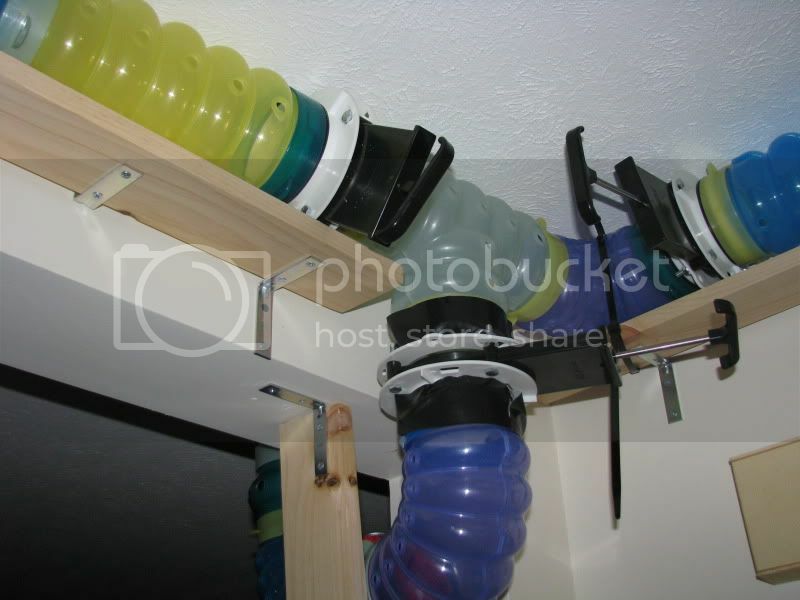 are a fantastic way to stimulate your ferret’s mind and body. It provides great exercise, and allows them to explore new smells, textures, and experiences. We recommend an H-Style harness for most ferrets. Ferrets are intelligent, interactive animals who are quite easy to please. There are unlimited ways that you can provide them with constant and changing stimulation. Change their bedding, rearrange the play room, rotate out toys so they don’t get bored, toss in new cardboard boxes from your latest Amazon shipment…. The world is their playground! Here are some extra pictures of some safe toy ideas!